Looking to shine up and freshen your dentures to a like new shine? Then look no further than our CleanoSonic Denture Cleaning Kit! Included in this kit is everything you need to take advantage of the staggering cleaning power of ultrasonic cavitation (see our FAQ for more info). In case your valuable dentures happen to slip from your hands, always stand on a somehwat soft surface while working with them. If a soft bath mat or such isn't available, simply fold a towel and stand on that. Just like the teeth you were born with, dentures need to be brushed frequently to prevent the accumulation of plaque, stains, and unsightly buildup. We include a professional grade dental brush with our denture cleaning kit which is perfect for pre-scrubbing your dentures before they take a dip in the ultrasonic bath. Once scrubbed, give them a quick rinse under the tap to wash away any large bits of debris. Once the large particulate has been removed with a light pre-brushing, it's time to clean them in your sonic bath. Simply place your dentures fully submersed in a fresh tank of water and denture cleaning solution, hit the "on" switch, and let the powerful ultrasonics go to work! For very dirty dentures, a 2nd 5 minute cycle can be used. In general, your average household cleaner or toothpaste is not recommended for cleaning dentures. These chemicals may be too harsh or abrasive, causing irrepairable damage to your dentures. 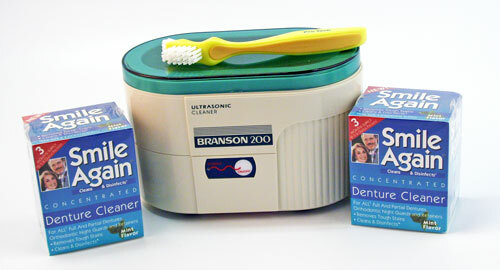 For this reason at CleanoSonic.com we offer Smile Again Denture Cleaning Concentrate to use along with our ultrasonic unit. After cleaning and when not in use, your dentures must be kept clean and moist to prevent them from drying out and warping. As every set of dentures is unique, ask your personal oral health care professional for the best way to store your specific set of dentures.